This Coca Cola bottle looks like something you'd see for sale on eBay. I'm told it's the only "special edition Coke" ever dedicated to one person, with a picture and name on it. 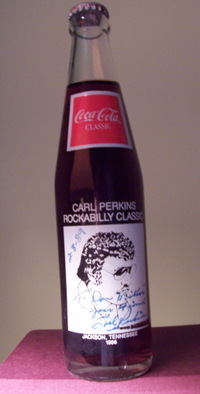 It features a drawing of Carl Perkins, and the label "Carl Perkins Rockabilly Classic". Carl autographed this one to me in February of 1989. He signed it "Your friend, Carl Perkins". You know, there are so many interesting things for sale on eBay, and I'm always wondering how much little mementoes like this one might be worth. Out of curiosity, my wife and I surfed around a bit, but couldn't find another one like it, so I don't know it's monetary value. Carl Perkins was one of that incredible lineup of stars who launched their careers at Sun Records in Memphis in the early and mid 1950's. You know the others: Jerry Lee Lewis, Elvis Presley, Johnny Cash, Roy Orbison, Conway Twitty, and even Charlie Rich. But even with all that star power, it was Carl Perkins who had the first million seller for Sun, with his recording of Blue Suede Shoes -- which he also wrote -- in 1956. 30 years later, the special edition Coca Cola was issued, on the anniversary of that Gold Record. All the proceeds from the sale went to the Carl Perkins Center for the Prevention of Child Abuse. That Center is a primary source of help in Jackson, Tennessee, for youngsters caught in the grips of abuse. Carl was a civic minded type, and founded the center in 1979 -- not because he'd ever experienced child abuse personally -- but because he saw a story on TV about a child who died as the result of child abuse. Carl thought the child resembled one of his own children, and it touched him deeply. Carl was a nice man, with a good, loving family, who was - and is - deeply respected by generations of performers. After Carl's big hit with Blue Suede Shoes, Elvis Presley did his version of that song and went on to fame and fortune far beyond what Carl was ever to achieve. But, as someone once said in comparing Elvis and Carl, "whose life would you rather have lived?" Carl died on January 19th, 1998 at the age of 65. I'm actually glad I didn't find another bottle of Carl Perkins Coca Cola on eBay. Nice story. I have the very same bottle, bought it at Suede´s Restaurant in 2002. Unfortunately Carl was already gone to r´n´r heaven. I went there a couple years later, and the place was closed down. It´s a shame, cause it´s a great place, it smelled r´n´r! Do you know if it will ever be opened again? Wow... I never ate at Suede's. So I don't know about it. Many of the stars used to have restaurants here in Nashville. We had Minnie Pearl's chicken place... Tex Ritter's hamburger place... Kenny Rogers' chicken... Roger Miller's hotel and restaurant, and several others. They've all gone away now.